Materials: Remnant of a Roger Arlington Tapestry Fabric, Cotton,/Linen, Linen Velvet Designer Fabric Back, Variegated Loop Fringe, Zipper. Description: An Artisanaware Decorative Pillow Cover Made from a Remnant of One of the Most Fabulous of Designer Fabric Lines of the Past, Roger Arlington. A Light-Hearted Woven Tapestry in Greens, Rose, and Yellow Gold. 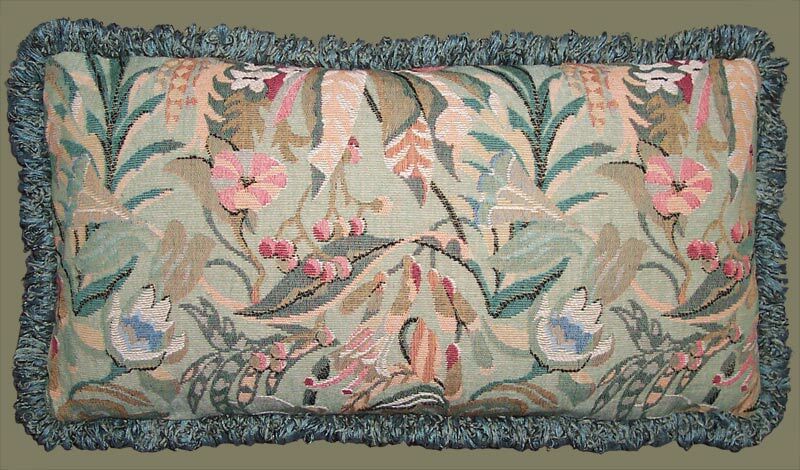 Back is an “Antique” Linen Velvet in Soft Green which Matches the Base Green of the Tapestry. A One of a Kind Throw Pillow Cover With Variegated Loop Fringe and Zipper. Center This Long, Narrow Accent Pillow Cover Amongst Companion Pillows on a Sofa, Loveseat or Bed. This Throw Pillow Cover is Compatible With Many Greens, Teal and Warm Tones of Rose, Pink, and Gold.